"Why?" is the first question we learn to ask as children and the one our parents have the hardest time answering. This is because "Why?" is the most difficult question to research. 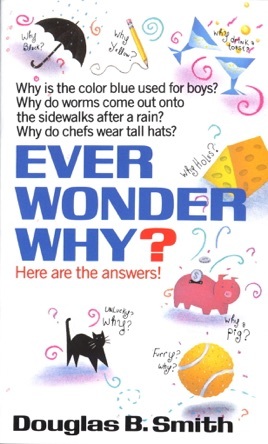 Why is the color blue used for boys? Why do worms come out onto sidewalks after a rain? Why do chefs wear tall hats? Everyone knows that . . . But how many of us know why? You'll learn the answers and a whole lot more in this fun and fact-filled almanac. And all you have to do is ask WHY? !